Halifax, formally known as the Halifax Regional Municipality (HRM), is the capital of the Canadian province of Nova Scotia. It had a population of 403,131 in 2016, with 316,701 in the urban area centred on Halifax Harbour. The regional municipality consists of four former municipalities that were amalgamated in 1996: Halifax, Dartmouth, Bedford, and Halifax County. Halifax is a major economic centre in Atlantic Canada with a large concentration of government services and private sector companies. Major employers and economic generators include the Department of National Defence, Dalhousie University, Saint Mary's University, the Halifax Shipyard, various levels of government, and the Port of Halifax. Agriculture, fishing, mining, forestry and natural gas extraction are major resource industries found in the rural areas of the municipality. Halifax is located within the traditional ancestral lands of the Mi'kmaq indigenous peoples, known as Mi'kma'ki. The Mi'kmaq have resided in Nova Scotia, New Brunswick and Prince Edward Island since prior to European landings in North America in the 1400s and 1500s to set up fisheries. The Mi'kmaq name for Halifax is K'jipuktuk, pronounced "che-book-took". The first permanent European settlement in the region was on the Halifax Peninsula. The establishment of the Town of Halifax, named after the 2nd Earl of Halifax, in 1749 led to the colonial capital being transferred from Annapolis Royal. The establishment of Halifax marked the beginning of Father Le Loutre's War. The war began when Edward Cornwallis arrived to establish Halifax with 13 transports and a sloop of war on June 21, 1749. By unilaterally establishing Halifax, the British were violating earlier treaties with the Mi'kmaq (1726), which were signed after Father Rale's War. Cornwallis brought along 1,176 settlers and their families. To guard against Mi'kmaq, Acadian and French attacks on the new Protestant settlements, British fortifications were erected in Halifax (Citadel Hill) (1749), Bedford (Fort Sackville) (1749), Dartmouth (1750), and Lawrencetown (1754), all areas within the modern-day Regional Municipality. St. Margaret's Bay was first settled by French-speaking Foreign Protestants at French Village, Nova Scotia who migrated from Lunenburg, Nova Scotia during the American Revolution. December 1917 saw one of the greatest disasters in Canadian history, when the SS Mont-Blanc, a French cargo ship carrying munitions, collided with the Belgian Relief vessel SS Imo in "The Narrows" between upper Halifax Harbour and Bedford Basin. The resulting explosion, the Halifax Explosion, devastated the Richmond District of Halifax, killing approximately 2,000 people and injuring nearly 9,000 others. The blast was the largest artificial explosion before the development of nuclear weapons. Significant aid came from Boston, strengthening the bond between the two coastal cities. The four municipalities in the Halifax urban area had been coordinating service delivery through the Metropolitan Authority since the late 1970s, but remained independent towns and cities until April 1, 1996, when the provincial government amalgamated all municipal governments within Halifax County to create the Halifax Regional Municipality. The municipal boundary thus now includes all of Halifax County except for several First Nation reserves. Since amalgamation, the region has officially been known as the Halifax Regional Municipality (HRM), although "Halifax" has remained in common usage for brevity. On April 15, 2014, the regional council approved the implementation of a new branding campaign for the region developed by the local firm Revolve Marketing. The campaign would see the region referred to in promotional materials simply as "Halifax", although "Halifax Regional Municipality" would remain the region's official name. The proposed rebranding was met with mixed reaction from residents, some of whom felt that the change would alienate other communities in the municipality through a perception that the marketing scheme would focus on Metropolitan Halifax only, while others expressed relief that the longer formal name would no longer be primary. Mayor Mike Savage defended the decision, stating: "I'm a Westphal guy, I'm a Dartmouth man, but Halifax is my city, we’re all part of Halifax. Why does that matter? Because when I go and travel on behalf of this municipality, there isn’t a person out there who really cares what HRM means." Unlike most municipalities with a sizeable metropolitan area, the Halifax Regional Municipality's suburbs have been completely incorporated into the "central" municipality, often by referendum. For example, the community of Spryfield, in the Mainland South area, voted to amalgamate with Halifax in 1968. The most recent amalgamation, which brought the entirety of Halifax County into the Municipality, has created a situation where a large "rural commutershed" area encompasses almost half the municipality's landmass. The Halifax Regional Municipality occupies an area of 5,577 km2 (2,153 sq mi), which is approximately 10% of the total land area of Nova Scotia. The land area of HRM is comparable in size to the total land area of the province of Prince Edward Island, and measures approximately 165 km (103 mi) in length between its eastern and western-most extremities, excluding Sable Island. The nearest point of land to Sable Island is not in HRM, but rather in adjacent Guysborough County. However, Sable Island is considered part of District 7 of the Halifax Regional Council. The coastline is heavily indented, accounting for its length of approximately 400 km (250 mi), with the northern boundary of the municipality usually being between 50–60 km (31–37 mi) inland. The coast is mostly rock with small isolated sand beaches in sheltered bays. The largest coastal features include St. Margarets Bay, Halifax Harbour/Bedford Basin, Cole Harbour, Musquodoboit Harbour, Jeddore Harbour, Ship Harbour, Sheet Harbour, and Ecum Secum Harbour. The municipality's topography spans from lush farmland in the Musquodoboit Valley to rocky and heavily forested rolling hills. It includes a number of islands and peninsulas, among them McNabs Island, Beaver Island, Melville Island, Deadman's Island and Sable Island. Halifax has a humid continental climate (Köppen Dfb), bordering on an oceanic climate, with warm summers and relatively mild winters, which is due to Gulf Stream moderation. The weather is usually milder in the winter or cooler in the summer than areas at similar latitudes inland, with the temperature remaining (with occasional notable exceptions) between about −8 °C (18 °F) and 24 °C (75 °F). January is the coldest month, being the only month with a high that is slightly below freezing at −0.1 °C (31.8 °F), while August is the warmest. The sea heavily influences the climate of the area, causing significant seasonal lag in summer, with August being significantly warmer than June and with September being the third mildest month in terms of mean temperature. The January mean is only 1.1 °C (2.0 °F) colder than the isotherm for the oceanic climate. Snowfall in Halifax is heavy during the winter, although snow cover is usually patchy owing to the frequent freeze-thaw cycles. Precipitation is high year-round. Winter features a mix of rain, freezing rain and snow with frequent freeze-thaw cycles. Snowfall is heavy in winter, but snow cover is usually patchy owing to the frequent freeze-thaw cycles, which melt accumulated snow. Some winters feature colder temperatures and fewer freeze-thaw cycles; the most recent of which being the winter of 2014–2015, which was the coldest, snowiest and stormiest in about a century. Spring is often wet and cool and arrives much later than in areas of Canada at similar latitudes, due to cooler sea temperatures. Summers are mild and pleasant, with hot and humid conditions very infrequent. Warm, pleasant conditions often extend well into September, sometimes into mid-October. Average monthly precipitation is highest from November to February due to intense late-fall to winter storms migrating from the Northeastern U.S., and lowest in summer, with August being the year's warmest and driest month on average. Halifax can sometimes receive hurricanes, mostly between August and October. An example is when Hurricane Juan, a category 2 storm, hit in September 2003 and caused considerable damage to the region. Hurricane Earl grazed the coast as a category 1 storm in 2010. Atlantic sea surface temperatures have risen in recent years, making Halifax and the coast of Nova Scotia somewhat more susceptible to hurricanes than the area had been in the past. The highest temperature ever recorded in the city of Halifax was 37.2 °C (99 °F) on July, 10 1912, and the lowest temperature recorded was −29.4 °C (−21 °F) on February 18, 1922. The March 2012 North American heat wave brought unusually high temperatures to the city of Halifax. On March 22, the mercury climbed to 28.2 °C (82.8 °F) at the Halifax Windsor Park weather station, and 27.2 °C (81 °F) at Halifax Stanfield International Airport. In spite of the possibility of high temperatures, in a normal year there is only one day that goes above 30 °C (86 °F). Halifax also has a modest frost count by Canadian standards due to the maritime influence, averaging 131 air frosts and 49 full days below freezing annually. On average the frost-free period is 182 days, ranging from May 1 to October 31. A map of Halifax's Community Planning Areas. The Halifax Regional Municipality is an amalgamation of four municipal governments in the urban and rural areas. There are over 200 official rural and urban communities within Halifax County that have maintained their original geographic names, including the dissolved cities of Halifax and Dartmouth and the town of Bedford. These community names are used on survey and mapping documents, for 9-1-1 service, municipal planning, and postal service. The Halifax Regional Municipality is divided into eighteen community planning areas which are further divided into neighbourhoods or villages. The regional municipality has taken steps to reduce duplicate street names for its 9-1-1 emergency dispatch services; at the time of amalgamation, some street names were duplicated several times throughout the municipality. Halifax is famed for the quality of several of its neighbourhoods. Spring Garden, adjacent to downtown Halifax, is a lively mixed-use neighbourhood with a variety of shopping and entertainment options as well as the new Halifax Central Library. The area has seen an uptick in development over the past few years, with new housing being built on most of the surface parking lots. The North End is a multicultural and artistic neighbourhood with a long history centred on several community nodes including the venerable Gottingen Street and Hydrostone commercial areas. The Quinpool District forms the community centre of the West End. Downtown Dartmouth offers dining and shopping, and has also been subject to revitalization with the redevelopment of the Dartmouth Marine Slips as the King's Wharf housing area. North Preston, just outside Dartmouth, is Canada's largest and oldest black community. Halifax is also known for its high walkability, particularly on the Halifax Peninsula, where 25-50% of residents regularly walk to work. Unlike numerous other North American cities, expressways were never built in the urban core (with the exception of the truncated Harbour Drive), resulting in high pedestrian connectivity. Peninsular Halifax is also mixed-use, contributing to an elevated quality of urban convenience and vibrancy as compared to suburban districts with highly segregated land use and car-oriented transportation networks. In recent years, the city has also begun to place increased emphasis on developing bicycling infrastructure. The Halifax Town Clock overlooks most of the structures in downtown Halifax. Halifax's urban core is home to a number of regional landmark buildings and retains significant historic buildings and districts. Downtown office towers are overlooked by the fortress of Citadel Hill with its iconic Halifax Town Clock. The architecture of Halifax's South End is renowned for its grand Victorian houses while the West End and North End, Halifax have many blocks of well-preserved wooden residential houses with notable features such as the "Halifax Porch". Dalhousie University's campus is often featured in films and documentaries. Surrounding areas of the municipality, including Dartmouth and Bedford, also possess their share of historic neighbourhoods and properties. The urban core is home to several blocks of typical North American high-rise office buildings; however, segments of the downtown are governed by height restrictions which prevent buildings from obstructing certain sight lines between Citadel Hill and the Halifax Harbour. This has resulted in some modern high rises being built at unusual angles or locations. The Halifax area has a variety of public spaces, ranging from urban gardens, public squares, expansive forested parks, and historic sites. The original grid plan devised when Halifax was founded in 1749 included a central military parade square, the Grand Parade. The square hosts the City Hall at one end, and is a popular site for concerts, political demonstrations, as well as the annual Remembrance Day ceremony at the central cenotaph. Another popular downtown public space is the timber Halifax Boardwalk, which stretches approximately 3 km (1.9 mi) and is integrated with several squares and monuments. Halifax Public Gardens is a Victorian era public garden in the city. The Gardens was designated as a National Historic Sites of Canada in 1984. The Halifax Common, granted for the use of citizens in 1763, is Canada's oldest public park. Centrally located on the Halifax peninsula, the wide fields are a popular location for sports. The slopes of Citadel Hill, overlooking downtown, are favoured by sunbathers and kite-flyers. The Halifax Public Gardens, a short walk away, are Victorian era public gardens formally established in 1867 and designated a National Historic Site in 1984. Victoria Park, across the street, contains various monuments and statues erected by the North British Society, as well as a fountain. In contrast to the urban parks, the expansive Point Pleasant Park at the southern tip of the peninsula is heavily forested and contains the remains of numerous British fortifications. Located on the opposite side of the harbour, the Dartmouth Commons is a large park next to Downtown Dartmouth laid out in the 1700s. It is home to the Leighton Dillman gardens and various sports grounds. Nearby, the Dartmouth waterfront trail stretches from Downtown Dartmouth to Woodside. Among residents of central Dartmouth, the area around Sullivan's Pond and Lake Banook is popular for strolling and paddling. The forested Shubie Park, through which the historic Shubenacadie Canal runs, is a major park in suburban Dartmouth. Mainland Halifax is home to several significant parks, including Sir Sandford Fleming Park, gifted to the people of Halifax by Sir Sandford Fleming. It houses the Dingle Tower, dedicated in 1912 by the Duke of Connaught to commemorate 150 years of representative government in Nova Scotia. The Mainland Common, in Clayton Park, is a modern park home to various sports and community facilities. Long Lake Provincial Park, comprising more than 2,000 hectares, was designated in 1984 and affords Halifax residents access to a scenic wilderness in close proximity to the city. 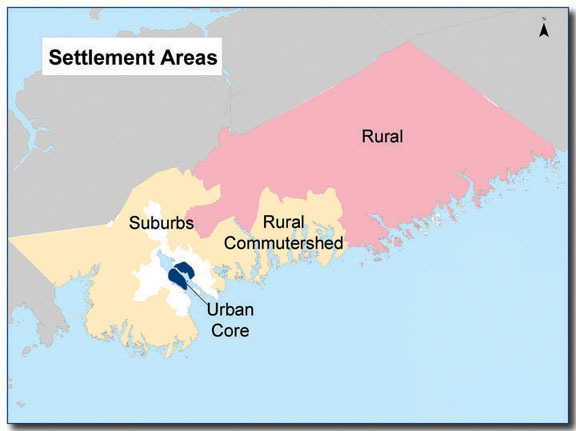 Urban, suburban, and rural divisions as defined by HRM planning department. The majority of Halifax is made up of rural areas. Halifax is centred on the urban core and surrounded by areas of decreasing population density. Rural areas lie to the east, west and north of the urban core. The Atlantic Ocean lies to the south. Certain rural communities on the urban fringe function as suburban or exurban areas, with the majority of those residents commuting to and working in the urban core. Farther away, rural communities in the municipality function like any resource-based area in Nova Scotia, being sparsely populated and their local economies developing around four major resource industries: agriculture, in the Musquodoboit Valley, fishing, along the coast, mining, in the Musquodoboit Valley and in Moose River Gold Mines and forestry, in most areas outside the urban core. Also, the tourism industry is beginning to change how some rural communities in Halifax function, particularly in communities such as Hubbards, Peggys Cove, with its notable lighthouse and Lawrencetown, with Lawrencetown Beach. There are two other large beaches along the coast, Martinique Beach, near Musquodoboit Harbour and Taylor Head Beach, located in Spry Bay, within the boundaries of Taylor Head Provincial Park. The northeastern area of the municipality, centred on Sheet Harbour and the Musquodoboit Valley, is completely rural, with the area sharing more in common with the adjacent rural areas of neighbouring Guysborough, Pictou and Colchester counties. Most economic activity in the Musquodoboit Valley is based around agriculture, as it is the largest farming district in the municipality. Most coastal communities are based around the fishing industry. Forestry is active in this area as well. It is also prevalent in the Musquodoboit Valley, but it takes a backseat to the more prominent agricultural industry. View of Purdy's Wharf, an office complex in Metropolitan Halifax. Metropolitan Halifax is a term used to describe the urban concentration surrounding Halifax Harbour, including the Halifax Peninsula, the core of Dartmouth, and the Bedford-Sackville areas. It is the Statistics Canada "population centre" of Halifax (2016 pop: 316,701). The dense urban core is centred on the Halifax Peninsula and the area of Dartmouth inside of the Circumferential Highway. The suburban area stretches into areas known as Mainland Halifax to the west, Cole Harbour to the east, and Bedford, Lower Sackville and Windsor Junction areas to the north. This urban area is the most populous on Canada's Atlantic coast, and the second largest coastal population centre in the country after Vancouver, British Columbia. Halifax currently accounts for 40% of Nova Scotia's population, and 15% of that of Atlantic Canada. Metropolitan Halifax benefits from a process of increased rural depopulation and corresponding urban growth in Atlantic Canada during the late 20th century—a demographic shift that was delayed several decades in the region compared with other parts of North America. Halifax is home to the Art Gallery of Nova Scotia, the largest art gallery in Atlantic Canada. Halifax is a major cultural centre within the Atlantic provinces. The city has maintained many of its maritime and military traditions, while opening itself to a growing multicultural population. The municipality's urban core also benefits from a large population of post-secondary students who strongly influence the local cultural scene. Halifax has a number of art galleries, theatres and museums, as well as most of the region's national-quality sports and entertainment facilities. Halifax is also the home to many of the region's major cultural attractions, such as Halifax Pop Explosion, Symphony Nova Scotia, the Art Gallery of Nova Scotia, The Khyber, the Maritime Museum of the Atlantic and the Neptune Theatre. The region is noted for the strength of its music scene and nightlife, especially in the central urban core. See List of musical groups from Halifax, Nova Scotia for a partial list. The Historic Properties are a collection of historical buildings on Halifax's boardwalk. Halifax hosts a wide variety of festivals that take place throughout the year, including the Atlantic Film Festival, the Royal Nova Scotia International Tattoo, the Halifax International Busker Festival, Greekfest, the Atlantic Jazz Festival, the Multicultural Festival, the largest Canada Day celebration east of Ottawa, Natal Day, the Halifax Pop Explosion, periodic Tall Ship events, Nocturne Festival, and Shakespeare by the Sea, to name a few. Halifax Pride is the largest LGBT event in Atlantic Canada and one of the largest in the country. Many of Halifax's festivals and annual events have become world-renowned over the past several years. Halifax is home to many performance venues, namely the Rebecca Cohn Auditorium, the Neptune Theatre, and The Music Room. The Neptune Theatre, a 43-year-old establishment located on Argyle Street, is Halifax's largest theatre. It performs an assortment of professionally produced plays year-round. The Shakespeare by the Sea theatre company performs at nearby Point Pleasant Park. Eastern Front Theatre performs at Alderney Landing in Downtown Dartmouth which can easily be accessed via the Halifax Transit ferry service. There are smaller performance venues at the Halifax Central Library, Citadel High School (Spatz Theatre), and Halifax West High School (Bella Rose Arts Centre). Halifax has also become a significant film-production centre, with many American and Canadian filmmakers using the streetscapes, often to stand in for other cities that are more expensive to work in. The Canadian Broadcasting Corporation has its Atlantic Canada production centres (radio and television) based in Halifax, and quite a number of radio and television programs are made in the region for national broadcast. The new Halifax Central Library on Spring Garden Road has received accolades for its architecture and has been described as a new cultural locus, offering many community facilities including a 300-seat auditorium. The community of Peggy's Cove is a major tourist attraction. Halifax's tourism industry showcases Nova Scotia's culture, scenery and coastline. There are several museums and art galleries in downtown Halifax. The Canadian Museum of Immigration at Pier 21, an immigrant entry point prominent throughout the 1930s, 1940s, and 1950s, was opened to the public as a National Historic Site of Canada in 1999 and is the only national museum in the Atlantic provinces. The Maritime Museum of the Atlantic is a maritime museum containing extensive galleries including a large exhibit on the famous Titanic, over 70 small craft and a 200-foot (61 m) steamship CSS Acadia. In summertime the preserved World War II corvette HMCS Sackville operates as a museum ship and Canada's naval memorial. The Art Gallery of Nova Scotia is housed in a 150-year-old building containing over 9000 works of art. The Black Cultural Centre for Nova Scotia in Dartmouth reflects the region's rich ethnic heritage. The Halifax Boardwalk is a public footpath along Halifax Harbour. Halifax has numerous National Historic Sites, most notably Citadel Hill (Fort George). Just outside the urban area, the iconic Peggys Cove is internationally recognized and receives more than 600,000 visitors a year. The waterfront in Downtown Halifax is the site of the Halifax Harbourwalk, a 3-kilometre (2 mi) boardwalk popular amongst tourists and locals alike. Many mid-sized ships dock here at one of the many wharfs. The harbourwalk is home to a Halifax Transit ferry terminal, hundreds of stores, Historic Properties, several office buildings, the Casino Nova Scotia, and several public squares where buskers perform, most prominently at the annual Halifax International Busker Festival every August. Downtown Halifax, home to many small shops and vendors, is a major shopping area. It is also home to several shopping centres, including Scotia Square, Barrington Place Shops, and Maritime Mall. Numerous malls on Spring Garden Road, including the Park Lane Mall, are also located nearby. The area is home to approximately 200 restaurants and bars, offering a wide array of world cuisines. There are also more than 60 sidewalk cafes that open in the summer months. The nightlife is made up of bars and small music venues as well as Casino Nova Scotia, a large facility built partially over the water. Cruise ships visit the province frequently. In 2015, the Port of Halifax welcomed 141 vessel calls with 222,309 passengers. The Scotiabank Centre is the largest multi-purpose sporting arena in Atlantic Canada. Halifax has various recreational areas, including ocean and lake beaches and rural and urban parks. It has a host of organized community intramural sports at various facilities. Public schools and post-secondary institutions offer varsity and intramural sports. The Scotiabank Centre is largest arena in Atlantic Canada. It plays host to most of the major sporting events and concerts that visit Halifax and is home to several semi-professional sport franchises, including the Halifax Hurricanes of the NBL Canada and the Halifax Mooseheads of the Quebec Major Junior Hockey League. The Royal Nova Scotia International Tattoo is held here every year. The facility is connected to the Downtown Halifax Link, and directly to the World Trade and Convention Centre. The region has hosted several major sporting events, including the 2003 World Junior Hockey Championship, 2003 Nokia Brier, the 2004 Women's World Ice Hockey Championships, the 2005 Canadian Olympic Curling Trials, and 2007 World Indoor Lacrosse Championship. From 1984 to 2007, the region was home to the CIS Men's Basketball Championship; the tournament was moved to Ottawa, Ontario, from 2008 to 2010 and returned to Halifax in 2011 and 2012. The 2008 Men's World Ice Hockey Championships was held between May 2 and 18, 2008, in Halifax and Quebec City. Halifax was selected in 2006 as the host city in Canada's bid for the 2014 Commonwealth Games but withdrew on March 8, 2007, well before the November 9, 2007 selection date, citing financial uncertainties. In February 2011, the municipality hosted the 2011 Canada Winter Games. On May 26, 2013, the Halifax Mooseheads capped a 74-win season (going 74-7-3-1) by defeating the Portland Winterhawks 6-4 in the MasterCard Memorial Cup Final, earning their first Memorial Cup in the process. Halifax is also home to several rugby clubs, the Halifax Rugby Football Club, Halifax Tars, Dartmouth PigDogs, Riverlake Ramblers and the Eastern Shore Rugby Football Club. The Halifax Gaels are the local Hurling and Gaelic Football team that compete in Canadian GAA events. The city is also home to HFX Wanderers FC, a professional soccer club that competes in the Canadian Premier League. Headquarters for The Chronicle Herald, the only local daily newspaper in Halifax. Halifax is the Atlantic region's central point for radio broadcast and press media. CBC Television, CTV Television Network (CTV), and Global Television Network and other broadcasters all have important regional television concentrators in HRM. CBC Radio has a major regional studio and there are also regional hubs for Rogers Radio and various private broadcast franchises, as well as a regional bureau for The Canadian Press/Broadcast News. Halifax's print media is centred on its single daily newspaper, the broadsheet Chronicle Herald as well as two free newspapers, the daily commuter-oriented edition of Metro International and the free alternative arts weekly The Coast. Frank provides the municipality with a bi-weekly satirical and gossip magazine. The city has several online daily newspapers. allNovaScotia is a daily, subscriber-only outlet which focuses on business and political news from across the province. Local Xpress is a free online newspaper covering local and national news, sports, business and entertainment created by the journalists of the Chronicle Herald during their 2016-2017 strike. The Halifax Examiner was founded by the former news editor of The Coast in 2014 and, like allNovaScotia, is supported through subscriptions. From 1974-2008, Halifax had a second daily newspaper, the tabloid The Daily News which still publishes several neighbourhood weekly papers such as The Bedford-Sackville Weekly News, The Halifax West-Clayton Park Weekly News and the Dartmouth-Cole Harbour Weekly News. These weekly papers compete with The Chronicle-Herald's weekly Community Heralds HRM West, HRM East, and HRM North. Halifax is a religiously diverse city with such landmark religious institutions as the United Rockingham Church, St. Andrew's United Church, the Ummah Mosque and Community Centre, the Centre for Islamic Development, the Vedanta Ashram Society – Lokah Samastah Sukhino Bhavantu, the Atlantic Theravada Buddhist Temple, the Beth Israel Synagogue, and the Shaar Shalom Synagogue. Halifax also houses the Atlantic School of Theology for religious studies. In the 2016 Census of Population conducted by Statistics Canada, the Halifax Regional Municipality recorded a population of 403,131 living in 173,324 of its 187,338 total private dwellings, a change of 3.3% from its 2011 population of 390,086. With a land area of 5,490.35 km2 (2,119.84 sq mi), it had a population density of 73.4/km2 (190.2/sq mi) in 2016. In 2016, 15% of the population was 14 years old or younger, while 16% were 65 and older. St. Paul's Church is the oldest church in Halifax. In the 2016 census, more than 71 percent of residents in Halifax claimed an affiliation with a Christian denomination. The urban area of Halifax is a major economic centre in eastern Canada with a large concentration of government services and private sector companies. Halifax serves as the business, banking, government and cultural centre for the Maritime region. The largest employment sectors in the city include trade (36,400 jobs), health care and social assistance (31,800 jobs), professional services (19,000 jobs), education (17,400 jobs), and public administration (15,800 jobs). The Halifax economy is growing, with the Conference Board of Canada predicting strong 3.0% GDP growth for 2015. The Halifax Shipyards of Irving Shipbuilding. Irving is a major employer in Halifax. Major employers and economic generators include the Department of National Defence, the Port of Halifax, Irving Shipbuilding, the Nova Scotia Health Authority, IMP Group, Bell Aliant, Emera, the Bedford Institute of Oceanography, government, banks, and universities. The municipality has a growing concentration of manufacturing industries and is becoming a major multi-modal transportation hub through growth at the port, the Halifax Stanfield International Airport, and improving rail and highway connections. Halifax is one of Canada's top four container ports in terms of the volume of cargo handled. A real estate boom in recent years has led to numerous new property developments, including the gentrification of some former working-class areas. Agriculture, fishing, mining, forestry and natural gas extraction are major resource industries found in the rural areas of the municipality. Halifax's largest agricultural district is in the Musquodoboit Valley; the total number of farms in Halifax is 150, of which 110 are family-owned. Fishing harbours are located along all coastal areas with some having an independent harbour authority, such as the Sheet Harbour Industrial Port, and others being managed as small craft harbours under the federal Fisheries and Oceans Canada. Other resource industries in Halifax include the natural gas fields off the coast of Sable Island, as well as clay, shale, gold, limestone, and gypsum extraction in rural areas of the mainland portion of the municipality. Limestone is extracted in the Musquodoboit Valley and gold is extracted in Moose River. Halifax City Council is the seat of municipal government. The Halifax Regional Municipality is governed by a mayor (elected at large) and a sixteen-person council. Councillors are elected by geographic district, with municipal elections occurring every four years. The current mayor of Halifax is Mike Savage. The Halifax Regional Council is responsible for all facets of municipal government, including the Halifax Regional Police, Halifax Public Libraries, Halifax Fire and Emergency, Halifax Regional Water Commission, parks and recreation, civic addressing, public works, waste management, and planning and development. The provincial legislation that provides governance oversight to the municipality is the Halifax Regional Municipality Charter. The city has a proposed operating budget of $869 million for 2015–2016. The city also has three community councils that consider local matters. Each community council comprises five or six regional councillors representing neighbouring districts. Most community council decisions are subject to final approval by regional council. As the capital city of Nova Scotia, Halifax is also the meeting place of the Nova Scotia House of Assembly, the oldest assembly in Canada and the site of the first responsible government in British North America. The legislature meets in Province House, a nearly 200-year-old National Historic Site in downtown Halifax hailed as one of the finest examples of Palladian architecture in North America. Halifax is home to Dalhousie University. Established in 1818, it is the oldest English-language post-secondary institution in Canada. Halifax has a well-developed network of public and private schools, providing instruction from grade primary to grade twelve; 136 public schools are administered by the Halifax Regional School Board, while six public schools are administered by the Conseil scolaire acadien provincial. The city's fourteen private schools are operated independently. The municipality is also home to the following post-secondary educational institutions: Dalhousie University, Saint Mary's University, Mount Saint Vincent University, University of King's College, Atlantic School of Theology, NSCAD University, and Nova Scotia Community College, in addition to the Halifax campus of Université Sainte-Anne and several private institutions. The largest of these, Dalhousie University, is Atlantic Canada's premier research-intensive university ranking 7th in Maclean's and 228th in the world. This school is host to most of the province's professional schools while other institutions focus primarily though not exclusively on undergraduate education. The plethora of university and college students contributes to the vibrant youth culture in the region, as well as making it a major centre for university education in eastern Canada. Halifax Harbour is a major port used by numerous shipping lines, administered by the Halifax Port Authority. The Royal Canadian Navy and the Canadian Coast Guard have major installations along prominent sections of coastline in both Halifax and Dartmouth. The harbour is also home to a public ferry service connecting downtown Halifax to two locations in Dartmouth. Sheet Harbour is the other major port in the municipality and serves industrial users on the Eastern Shore. The Port of Halifax is North America's first inbound and last outbound shipping gateway to Europe. The Halifax Port Authority's various shipping terminals constitute the eastern terminus of Canadian National Railway's transcontinental network. Via Rail Canada provides overnight passenger rail service from the Halifax Railway Station three days a week to Montreal with the Ocean, a train equipped with sleeper cars that stops in major centres along the way, such as Moncton. The Halifax Railway Station also serves as the terminus for Maritime Bus, which serves destinations across the Maritimes. Halifax Stanfield International Airport serves Halifax and most of the province, providing scheduled flights to domestic and international destinations. The airport served 4,083,188 passengers in 2017, making it Canada's eighth busiest airport by passenger traffic. Shearwater, part of CFB Halifax, is the air base for maritime helicopters employed by the Royal Canadian Navy and is located on the eastern side of Halifax Harbour. The urban core is linked by the Angus L. Macdonald and A. Murray MacKay suspension bridges, as well as the network of 100-series highways which function as expressways. The Armdale traffic circle is an infamous choke point for vehicle movement in the western part of the urban core, especially at rush hour. Public transit is provided by Halifax Transit, which operates standard bus routes, regional express bus routes, as well as the pedestrian-only Halifax-Dartmouth Ferry Service. Established in 1752, the municipality's ferry service is the oldest continuously running salt water ferry service in North America. Hakodate, Japan (1982). The cities chose to twin because they both have star forts and are both maritime ports. Halifax has donated many fir trees to the annual Hakodate Christmas Fantasy festival. Campeche, Mexico (1999). Campeche was chosen because, like Halifax, it is "a capital of a state" and is "a city of similar size to Halifax on or near the coast having rich historical tradition". Norfolk, Virginia, United States (2006). Norfolk was chosen because, like Halifax, its economy "depends heavily on the presence of the Armed Forces, and both cities are very proud of their military history". ^ 1996 figures onwards are for Halifax Regional Municipality. Prior figures are for Halifax County. ^ Based on station coordinates provided by Environment Canada and documentation from the Nova Scotian Institute of Science, weather data was collected in West End, Halifax from January 1863 to July 1933, at Citadel Hill from August 1933 to August 1939, at Downtown Halifax from September 1939 to July 1974, at Citadel Hill from August 1974 to January 2002 and at CFB Halifax (Windsor Park and Halifax Dockyard) from September 2004 to present. ^ a b c d "Population and dwelling counts, for Canada, provinces and territories, and census subdivisions (municipalities), 2016 and 2011 censuses – 100% data (Nova Scotia)". Statistics Canada. February 8, 2017. Retrieved February 12, 2017. ^ a b "Census Profile, 2016 Census: Halifax [Census metropolitan area], Nova Scotia and Halifax [Population centre], Nova Scotia". Statistics Canada. February 8, 2017. Retrieved February 21, 2017. ^ "Census Profile - Halifax (population centre)". Statistics Canada. Retrieved February 8, 2017. ^ "Census Profile - Halifax (municipality)". Statistics Canada. Retrieved February 8, 2017. ^ "Halifax schools to start each day by recognizing Mi'kmaq lands". CBC News. Retrieved July 14, 2017. ^ "Local organization refers to Halifax by Mi'kmaq name". CTV News. November 20, 2014. Retrieved July 18, 2017. ^ Wicken, p. 181; Griffith, p. 390; Also see "Recent Projects". Northeast Archaeological Research. 2003. Archived from the original on May 14, 2013. Retrieved February 5, 2014. ^ "CBC - Halifax Explosion 1917". Canadian Broadcasting Corporation. September 19, 2003. Retrieved February 25, 2011. ^ Time: Disasters that Shook the World. New York City: Time Home Entertainment. 2012. p. 56. ISBN 1-60320-247-1. ^ "Municipal History Highlights". Novascotia.ca. June 26, 2014. Retrieved July 13, 2014. ^ "Goodbye HRM, hello Halifax: Mixed reaction to bold, new brand". CTV News Atlantic. April 16, 2014. Retrieved April 24, 2014. ^ "Council Approves Bold New Brand Strategy for Halifax Region". Halifax Regional Municipality. Archived from the original on April 19, 2014. Retrieved April 24, 2014. ^ "Halifax mayor, council approve city's new brand". The Chronicle-Herald. April 15, 2014. Retrieved April 24, 2014. ^ "Halifax Regional Municipality Key Map" (PDF). Discover Halifax. Archived from the original (PDF) on May 8, 2006. ^ "Canadian Climate Normals 1981-2010 Station Data". Environment Canada. Retrieved May 31, 2015. ^ "Climate Normals for Halifax Citadel 1981-2010". Environment Canada. Retrieved November 7, 2015. ^ "July 1912 climate summary for Halifax". Climate.weatheroffice.gc.ca. September 22, 2015. Retrieved March 6, 2016. ^ "February 1922 climate summary for Halifax". Climate.weatheroffice.gc.ca. September 22, 2015. Retrieved March 6, 2016. ^ "March 22, 2012, Halifax Windsor Park". Climate.weatheroffice.gc.ca. September 22, 2015. Retrieved March 6, 2016. ^ "March 2012, Halifax Airport". Climate.weatheroffice.gc.ca. September 22, 2015. Retrieved March 6, 2016. ^ a b c "Canadian Climate Normals 1981-2010 Halifax Citadel". Environment Canada. Retrieved April 27, 2016. ^ "Halifax Citadel, Nova Scotia". Canadian Climate Normals 1981–2010. Retrieved May 12, 2016. ^ "Shearwater A, Nova Scotia". Canadian Climate Normals 1981–2010. Retrieved May 12, 2016. ^ "Monthly Data Report for 1871". Canadian Climate Data. Environment Canada. September 22, 2015. Retrieved March 24, 2016. ^ "Daily Data Report for October 1930". Canadian Climate Data. Environment Canada. September 22, 2015. Retrieved May 14, 2016. ^ "Monthly Data Report for 1939". Canadian Climate Data. Environment Canada. September 22, 2015. Retrieved March 24, 2016. ^ "Daily Data Report for April 1945". Canadian Climate Data. Environment Canada. September 22, 2015. Retrieved May 14, 2016. ^ "Halifax Dockyard". Canadian Climate Data. Environment Canada. September 22, 2015. Retrieved March 24, 2016. ^ "Abstract of Meteorological register, Halifax, Nova Scotia, 1863" (PDF). Myers, W. J. (1867). Nova Scotian Institute of Science. 1867. Retrieved September 4, 2016. ^ "Meteorological register, 1864" (PDF). Nova Scotian Institute of Science. 1867. Retrieved September 4, 2016. ^ "Abstract of Meteorological register, Halifax, Nova Scotia, 1865" (PDF). Nova Scotian Institute of Science. 1867. Retrieved September 4, 2016. ^ "Abstract of Meteorological register, Halifax, Nova Scotia, 1866" (PDF). Nova Scotian Institute of Science. 1867. Retrieved September 4, 2016. ^ "Meteorological record, Halifax, Nova Scotia, 1867" (PDF). Nova Scotian Institute of Science. 1868. Retrieved September 4, 2016. ^ "Meteorological summary, 1868" (PDF). Nova Scotian Institute of Science. 1869. Retrieved September 4, 2016. ^ "On the meteorology of Halifax, 1870" (PDF). Allison, F. (1871). Nova Scotian Institute of Science. 1871. Retrieved September 4, 2016. ^ "On the meteorology of Halifax, 1871" (PDF). Allison, F. (1872). Nova Scotian Institute of Science. 1872. Retrieved September 4, 2016. ^ "Halifax Stanfield INT'L A, Nova Scotia". Canadian Climate Normals 1981–2010. Environment Canada. Retrieved May 8, 2014. ^ "HRM - Regional Planning". Halifax.ca. August 25, 2006. Archived from the original on June 1, 2004. Retrieved April 8, 2011. ^ "HRM - Planning". Halifax.ca. March 30, 2011. Archived from the original on June 3, 2011. Retrieved April 8, 2011. ^ "Making Connections: 2014-19 Halifax Active Transportation Priorities Plan" (PDF). Halifax Regional Municipality. p. 6. Archived from the original (PDF) on January 7, 2016. ^ "Parks Civic Support Program" (PDF). Halifax Regional Municipality. Archived from the original (PDF) on July 15, 2014. Retrieved May 29, 2015. ^ "Long Lake Provincial Park Draft Park Management Plan". Province of Nova Scotia. Retrieved May 29, 2015. ^ "Settlement Areas". Halifax Regional Municipality. Archived from the original on June 14, 2007. Retrieved April 30, 2015. ^ "Mosher Limestone". Mosher Limestone Co. Ltd. Retrieved May 28, 2016. ^ "Moose River gold mine project gets green light. Natural Resources Minister says decision 'difficult' to make". CBCNews. Canadian Broadcasting Corporation. June 15, 2012. Retrieved May 28, 2016. ^ Rowlett, Russ. "Lighthouses of Eastern Nova Scotia". The Lighthouse Directory. University of North Carolina at Chapel Hill. Retrieved May 28, 2016. ^ "LAWRENCETOWN BEACH PROVINCIAL PARK". NOVASCOTIA.COM. Retrieved May 28, 2016. ^ "MARTINIQUE BEACH PROVINCIAL PARK". NOVASCOTIA.COM. Retrieved May 28, 2016. ^ "Day Use Parks — listed A-Z". Nova Scotia Government. Archived from the original on January 12, 2016. Retrieved May 28, 2015. ^ a b "Agriculture & Industry". TownCryer News. Archived from the original on January 8, 2016. Retrieved October 23, 2015. ^ "Census Profile - Halifax (population centre)". Statistics Canada. Retrieved March 7, 2012. ^ "HRM - Traffic and Transportation - Urban Core Boundaries". Halifax.ca. January 27, 2009. Archived from the original on June 3, 2011. Retrieved April 8, 2011. ^ "Peggy's Cove: Assessment of Capacity Issues and Potential Tourism Opportunities" (PDF). The Economic Planning Group of Canada. Archived from the original (PDF) on January 21, 2012. Retrieved December 26, 2011. ^ "About Downtown". Downtown Halifax Business Commission. Archived from the original on May 22, 2015. Retrieved May 27, 2015. ^ "Statistics". Cruise Halifax. Retrieved March 22, 2016. ^ "QMJHL Network". Theqmjhl.ca. Archived from the original on February 1, 2014. Retrieved January 24, 2014. ^ "OHL Network". Ontariohockeyleague.com. Retrieved January 24, 2014. ^ Bradshaw, James. "Subscription news site AllNovaScotia expands to Newfoundland". The Globe and Mail. Retrieved April 13, 2016. ^ "Community Profiles from the 2016 Census, Statistics Canada - Census Subdivision". 2.statcan.gc.ca. December 6, 2010. Retrieved April 13, 2013. ^ "Aboriginal Peoples - Data table". 2.statcan.ca. October 6, 2010. Retrieved April 13, 2013. ^ "NHS Profile, Halifax, RGM, Nova Scotia, 2011". statcan.ca. September 11, 2013. Retrieved January 20, 2016. ^ a b c "Introduction to Halifax" (PDF). Proposed Operating Budget 2015-2016. Halifax Regional Municipality. Archived from the original (PDF) on April 30, 2015. ^ "Transportation and Logistics Sector Profile" (PDF). Halifax Gateway Council. April 2012. ^ Bonney, Joseph (September 2, 2013). "Canada's Big 4 Container Ports Put Focus on Infrastructure". The Journal of Commerce. ^ "Port of Sheet Harbour". Halifax Port Authority. Retrieved November 25, 2015. ^ a b c "Halifax Regional Municipality Charter" (PDF). Nova Scotia Legislature. Retrieved May 31, 2015. ^ "2015-16 Operating & Project Budgets". Halifax Regional Municipality. Retrieved May 31, 2015. ^ "Community Council". Halifax Regional Municipality. Archived from the original on May 25, 2014. Retrieved May 31, 2015. ^ "Responsible Government". The Canadian Encyclopedia. Retrieved December 2, 2015. ^ "Province House". Canada's Historic Places. Parks Canada. Retrieved December 2, 2015. ^ "Nos Écoles". Conseil scolaire acadien provincial. Retrieved October 11, 2014. ^ "Airport Statistics". Halifax Stanfield International Airport. Halifax International Airport Authority. ^ "HRM - History - Main". Halifax.ca. Archived from the original on June 3, 2011. Retrieved April 8, 2011. ^ "July 4, 2000 - HRM Media Room Press Releases 2000". Halifax Regional Municipality. July 4, 2000. Archived from the original on July 8, 2003. Retrieved January 20, 2018. ^ "HRM-Hakodate Twinning 25th Anniversary". Halifax Regional Municipality. Archived from the original on March 15, 2016. Retrieved May 29, 2015. ^ "HRM to Twin with Norfolk, Virginia". Halifax.ca. August 25, 2006. Archived from the original on June 14, 2006. Retrieved April 8, 2011. Laffoley, Steven (2007). Hunting Halifax: In Search of History, Mystery and Murder. Pottersfield Press. ISBN 978-1895900934. Parker, Mike (2009). Fortress Halifax: Portrait of a Garrison Town. Nimbus Publishing. ISBN 9781551094946. Poole, Stephen (2012). Halifax: Discovering Its Heritage. Formac Publishing Company Limited. ISBN 9781459500525. Soucoup, Dan (2014). A Short History of Halifax. Nimbus Publishing. ISBN 9781771081849. Tattrie, Jon (2013). Cornwallis: The Violent Birth of Halifax. Pottersfield Press. ISBN 9781897426487. The 2002 Royal Bank Cup is the 32nd Junior "A" 2002 ice hockey National Championship for the Canadian Junior A Hockey League. The Royal Bank Cup was competed for by the winners of the Doyle Cup, Anavet Cup, Dudley Hewitt Cup, the Fred Page Cup and a host city. The tournament will be hosted by the Halifax Oland Exports in Halifax, Nova Scotia. The following is a list of buildings in the Halifax Regional Municipality, Nova Scotia with articles on Wikipedia. CJNI-FM (95.7 MHz) is a Canadian radio station in Halifax, Nova Scotia. CJNI-FM has a News/Talk/Sports radio format branded as News 95.7. The station is owned by Rogers Media which also owns sister station 92.9 CFLT-FM. CJNI-FM is currently the only commercial News/Talk/Sports station in Atlantic Canada. Studios and offices are on Young Street in Halifax, while the transmitter is located on Washmill Lake Drive in Clayton Park. Halifax, Nova Scotia has the largest selection of education options in Atlantic Canada. Fairview Cemetery is a cemetery in Halifax, Nova Scotia. It is perhaps best known as the final resting place for over one hundred victims of the sinking of the RMS Titanic. Officially known as Fairview Lawn Cemetery, the non-denominational cemetery is run by the Parks Department of the Halifax Regional Municipality. Halifax, formally known as Halifax Regional Municipality, is located in Nova Scotia, Canada. The municipality is governed by a mayor (elected at large) and a sixteen-person Regional Council, who are elected by geographic district; municipal elections occur every leap year.The Halifax Regional Council has also established smaller "community councils" wherein three or more councilors from a geographic area agree to form these councils to deal primarily with local development issues. Most community council decisions are subject to final approval by regional council.The Halifax Regional Council has responsibility for the Halifax Regional Police, Halifax Public Libraries, Halifax Regional Fire and Emergency, Halifax Regional Water Commission, Halifax Transit, parks and recreation, public works and waste management. The Halifax Citadels were a professional ice hockey team based in Halifax, Nova Scotia. They played in the American Hockey League between 1988 and 1993. They were created by the relocation of the Fredericton Express and filled a void left by the relocation of the Nova Scotia Oilers to Cape Breton. The Citadels, named after the Halifax Citadel military fort, were affiliated with the Quebec Nordiques National Hockey League team. Home games were played at the Halifax Metro Centre, located at the base of Citadel Hill. The franchise was moved to Cornwall, Ontario in 1993, where they were known as the Cornwall Aces. One year later, the Halifax Mooseheads of the QMJHL filled the void in the market. The Halifax Regional Centre for Education (formerly Halifax Regional School Board) is the public school district responsible for 136 elementary, junior high, and high schools located in the Halifax Regional Municipality in Halifax County, Nova Scotia. The current Regional Executive Director is Elwin LeRoux. The district's office is on Spectacle Lake Drive, Dartmouth. The district's stated vision is "to provide a high quality education to every student every day". On January 24, 2018 the provincial government announced would be dissolved and education administered by an appointed provincial council and the board was dissolved on March 31, 2018. The Halifax Thunderbirds will be a box lacrosse team in the National Lacrosse League. They will play at the Scotiabank Centre in Halifax, Nova Scotia. This is a list of mayors of the city Halifax, Nova Scotia. The City of Halifax is a former municipality in Nova Scotia which was amalgamated with the City of Dartmouth Town of Bedford and Halifax County to form the Halifax Regional Municipality in 1996. This is a list of mayors for the City of Halifax from 1841 until amalgamation. Prior to the formation of the city's elected government in 1841 the administration of the municipality was left in the hands of a selected group of men. The first mayor was elected to council and chosen for this position by his peers in council. Prior 1850 the mayor was elected amongst the elected councillors. The first mayor elected directly by citizens was William Caldwell. The mayor continues to act as a councillor-at-large and has a direct vote on all council decisions. This is a list of mayors of the Halifax Regional Municipality. Halifax's first Mayor, Walter Fitzgerald, was elected in 1996 after the municipality was created by amalgamation. The Mayor of the Halifax holds the highest office in the municipal government of Halifax. The mayor is elected at large during municipal elections, held every leap year and is the head of the Halifax Regional Council. The current mayor is Mike Savage, who has served since 2012. Little Dutch (Deutsch) Church is the second oldest building in Halifax, Nova Scotia after St. Paul's and was built for the Foreign Protestants. Halifax, Nova Scotia is the largest population centre in Atlantic Canada and contains the region's largest collection of media outlets. The Nova Scotia Oilers were a minor professional ice hockey team in the American Hockey League based in Halifax, Nova Scotia from 1984 to 1988. The Oilers played their home games at the Halifax Metro Centre, and were the AHL affiliate of the Edmonton Oilers, whose logo theirs resembled. The Oilers played four seasons before moving on. Larry Kish coached the first three seasons, followed by Ron Low in the fourth season. After the 1987–88 season, the team was relocated to Sydney, Nova Scotia becoming the Cape Breton Oilers. The void the Oilers left in Halifax was filled by the Halifax Citadels. St. Mary's Cathedral Basilica is a Gothic Revival Catholic cathedral located in downtown Halifax, Nova Scotia, Canada. It is the cathedral church of the Archdiocese of Halifax and is the largest Catholic church in the Archdiocese. Consecrated on October 19, 1899, it was made a basilica in 1950 by Pope Pius XII. The St. Mary's Cathedral Basilica boasts the tallest granite spire in North America. Upper Tantallon (pronounced 'tan-TAL-en') is a suburban community that extends from the Hammonds Plains Road (Route 213) to the crossroads of Trunk 3 and Route 333 within the Halifax Regional Municipality, 22.3 km west from Halifax, Nova Scotia, Canada. The community is likely named for Tantallon Castle in Scotland. York Redoubt is a redoubt situated on a bluff overlooking the entrance to Halifax Harbour at Ferguson's Cove, Nova Scotia, Canada, originally constructed in 1793. It was designated a National Historic Site of Canada in 1962.